This is great for sorting mail, but I also think it could be ideal for organising kids schoolwork, notes etc. With a shelf and a few magazine holders you can create a space for mail and accessories. 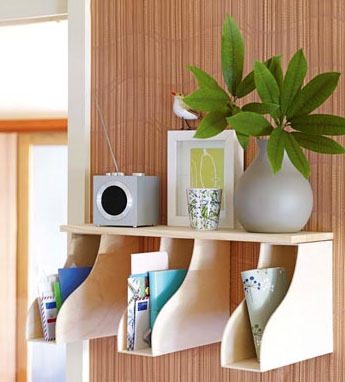 Simply purchase 3 magazine holders from IKEA and attach to a shelf to make your own mail station. That looks awesome! Thanks! I’m going to show hubby tonight and get HIM to make it! With only two adults in the house (the kids only get Birthday mail) you would think we would be more organised! Nope!! I have a metal frame magazine holder so I might dig that out and pop it somewhere so the mail is kept together (and not all over my kitchen bench) and the Mr will take note!!! Very cool, thanks for sharing! Something we desperately need around here.